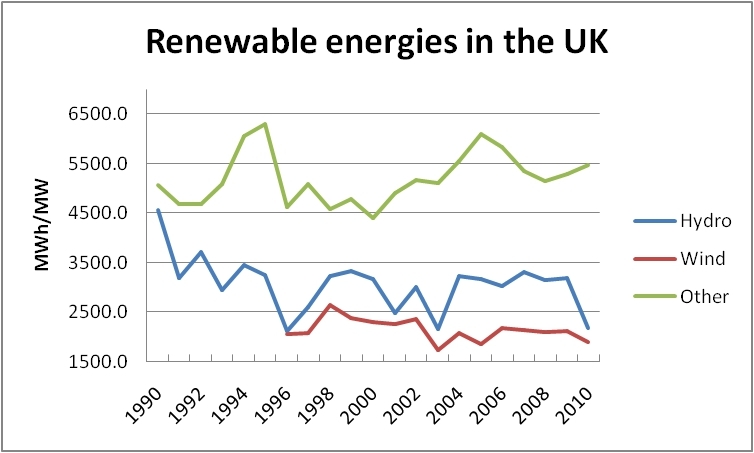 As in many other countries, the share of renewable energies in the UK is growing dramatically. During the past two decades renewables have surged at an impressive pace. 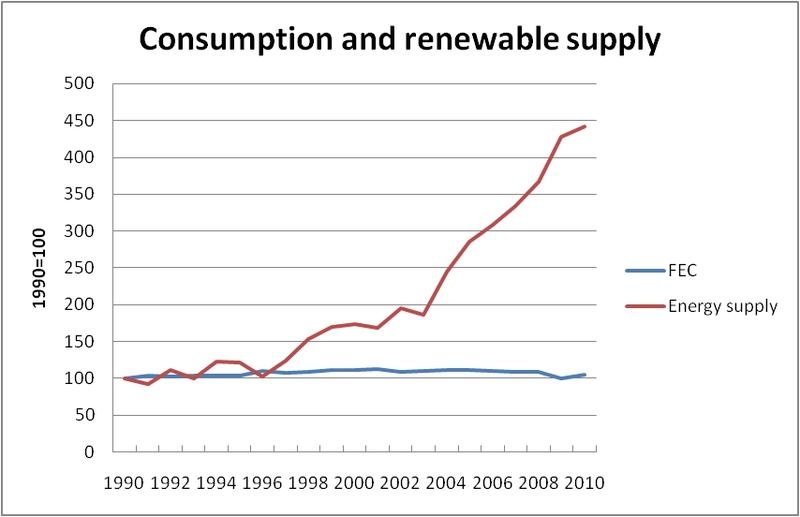 In fact, supply from renewable energy sources has more than quadrupled since 1990 whereas overall consumption has remained fairly constant. The raw data of this analysis stem from Eurostat and UK National Statistics. The huge gap in the respective trends between the overall energy demand and the contribution of renewables can be seen in Fig. 1 where the data for final energy consumption and the supply figures from renewable energies are shown. To make comparison easier we present the figures in an indexed form with 1990=100. Fig. 1 Final energy consumption (FEC) and energy supply from renewable sources in the UK. 1990=100. Whereas final energy consumption has increased only slightly (index value 105 in 2010) with a decreasing tendency since 2001, supply from renewables has more than quadrupled over the same period. Accordingly, the weight of hydro, wind, biomass etc. in the energy mix has risen sharply. Nevertheless, this picture should not obscure the fact that in 2010 renewables contributed only 7 % to the entire energy production. One interesting aspect of looking at the UK figures is to check the specific output of the various renewable energy sources, i.e. MWh produced per MW of installed capacity. Here we find significant differences between hydro, wind and other renewables as shown in Fig. 2. The latter comprise landfill gas, biofuels, waste combustion etc. Fig. 2 Specific output of renewable energy sources in MWh per MW installed. All of them show annual fluctuations which is normal since not the entire capacity is available all the time. Wind and hydro are particularly vulnerable to external factors. However, there is a significant difference between the two as regards short-term availability. Electricity generated from water is much more stable for the grid than wind which is by definition more erratic in its availability. Apart from that we can see clearly in Fig.2 that the specific output of the various sources differs enormously. The least efficient way to produce electricity from renewables is wind as becomes apparent from Fig. 2. This conclusion is fairly independent of the fluctuating nature of all the sources taken into consideration. The average output of wind farms is 2140 MWh per MW installed. The values for hydro and others are 3060 MWh/MW and 5200 MWh/MW, respectively. Thus we may safely conclude that using hydroelectric plants is on average 43 % more efficient than using wind turbines. The difference is even more striking for the other renewables which tend to be more than 140 % more efficient than wind. Given this state of affairs it might be worthwhile to put more emphasis on other green power sources rather than wind. However, wind farms have already become a significant factor in several countries as we have shown in some of our previous posts, e.g. here, here and here. Bearing in mind the inherent weaknesses of wind power, it appears that other renewables such as hydro and biomass are not only more reliable, but also more efficient. They, too, deserve their chance. Great read! How about a look into solar energy? Solar energy supports all life on Earth and is the basis for almost every form of energy we use. The sun makes plants grow, which can be burned as “biomass” fuel or, if left to rot in swamps and compressed underground for millions of years, in the form of coal and oil. Heat from the sun causes temperature differences between areas, producing wind that can power turbines.